Our Galvanized Sheet Metal Duct, or sometimes referred to as KD pipe is manufactured from high quality galvanized steel in convenient 3 foot lengths for easy handling. KD is referenced to "knock down" because upon installation the pipes seam is left open for cutting and fitting to your application such as vent piping and appliance, water heater or furnace. Once you snap the pipe together the connection is permanent. 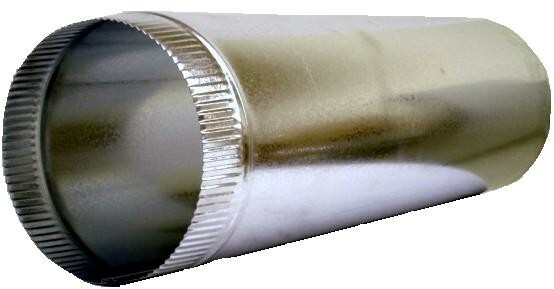 The connection of the sheet metal pipe is crimped for easy fitting of consecutive duct joints or to sheet metal fittings and Flexible duct. The seam on our galvanized sheet metal duct is formed on a snap-lock machine which allows ease of assembly on your job site. Just simply snap the seam together and install to your adjoining items.